If your tip led to an arrest - You may have a REWARD. Call 1-800-AA-CRIME between 12 & 1 PM (PST) any Tuesday to check for any pending Rewards. 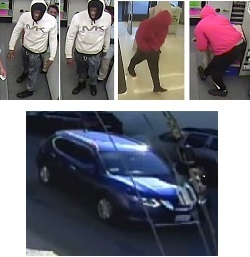 On April 15, 2019, at approximately 3:50 PM, the two suspects above entered the Rite Aid at 5712 Folsom Blvd. The suspects entered the pharmacy area and demanded Norco's and Oxycontin from the pharmacists. The suspects utilized what appeared to be a light-colored pillow case, put the pill bottles inside the bag, and fled the store on foot. A witness in the area observed the suspects enter a blue SUV and speed off. This incident is likely related to a prior pharmacy robbery of a Rite Aid at on J Street. 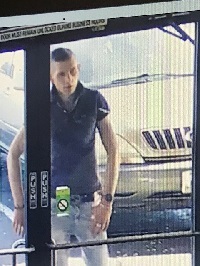 The vehicle is a photo of the suspect vehicle from the prior robbery and is described as a blue 2014-2019 Nissan Rogue. The California Exposition and State Fair Police Department is currently seeking the public’s help to identify the persons responsible for this crime. 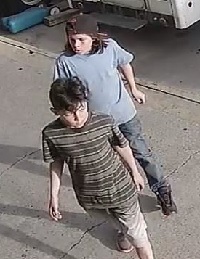 On Sunday evening, March 17, 2019, at approximately 6:30 PM, two unidentified male juveniles caused extensive property damage to the Grandstands; driving a golf-cart through a rod-iron fence; smashing a large plate glass window with a propane bottle; and causing other property damage belonging to Comcast Spectacor. The male juveniles fled before police arrived. The male juveniles may be affiliated with the RV Park, the Horseman’s Trailer Park, or some other venue at the state fairgrounds. On April 6, 2019, at 2:07 PM, the victim, aged 14, was walking toward an arriving train headed toward Cosumnes River College. Three Black male juveniles had just exited the train and confronted him. They surrounded him as he attempted to get away from them. Suspect #1 was facing him and punched him in the head just as Suspect #2 grabbed his lower legs from behind and lifted him up off the ground. The victim was able to get on his back while Suspect #1 repeatedly punched him in the head. Suspect #3 immediately removed the victim's black/white with pink highlights Jordan 4’s from his feet. Suspect #1 removed the victim's Iphone 6S Plus from his right pants pocket. All subjects fled toward Florin Road and out of camera view. One of the suspects may go by the name Mari. The Salinas Police Department is currently seeking the public’s help to identify the person responsible for this crime. 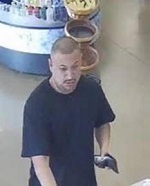 On March 18, 2019, at approximately 2:00 PM, a male and a female entered a store at 840 Northridge Shopping Center in Salinas and stole merchandise. The female suspect forced her way past a manager at the front of the store and shoved her to the ground as she ran out of the store. The manager sustained minor injuries. They fled in a silver 2008 Nissan Altima. The female suspect is described as Black, 20 to 30 years old, wearing a black dress with white writing down the sleeves. She had short hair in a bun on the top of her head. The male suspect has been identified as Giovonte Warren, living in Sacramento, and the owner of a vehicle used in this crime. On Tuesday, March 19, 2019, at approximately 10:02 PM, multiple gunshots were fired in the area of 4th Ave and 35th St. Officers ultimately recovered six casings on 4th Ave. Approximately twelve seconds later, multiple gunshots were fired around the corner, in front of 2910 35th St. In all, eleven casings were recovered, along with a live, unfired round. No one was injured, and the only property damage were several portions of a wrought iron fence. The fence borders the apartment complex located at 2910 35th St. The Sacramento Police Department is currently seeking the public’s help to identify the person responsible for this crime. 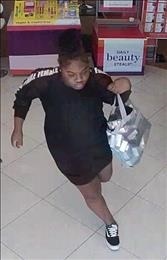 On March 15, 2019, at approximately 0255 hours, suspect was seen entering business Byuti Salon+Spa by breaking the window with a rock. 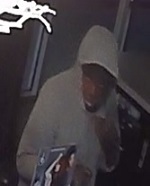 Suspect then took cash from the cash register, 2 IPad’s located below the register, and sample product. Video surveillance at the store captured images of the suspect but not the incident. The suspect was last seen leaving on foot eastbound through the Dollar General parking lot. 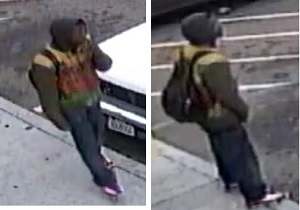 The suspect is described as a Black male adult with short “twisties” wearing a rainbow jacket and blue jeans. The Elk Grove Police Department is asking for the community’s assistance with identifying a suspect who wanted for five indecent exposure incidents that have happened in the City of Elk Grove as well as in other neighboring jurisdictions. In all cases, the male drives up to the victim, exposes himself while masturbating, once he gains the victim’s attention he leaves the area. The incidents started January 30, 2019, and the most recent incident occurred on March 14, 2019. There have been no reported injuries during any of these incidents. Some of the incidents have occurred in or near shopping center parking lots. UPDATE: On March 11, 2019, at around 9-9:15 am a white 24 - 26' box truck containing US Mail was stolen. The truck was parked near Parkway Boulevard and Industrial Boulevard in Wet Sacramento in the vicinity of the Sacramento Postal Plant. A dark-colored Mercedes was observed in the area around the time the truck was last seen. Per a witness description, the driver and passenger of the Mercedes were white males. There is an aluminum plate that runs across the front of the box part of the truck. The truck bears CA license plate # 94780J2. 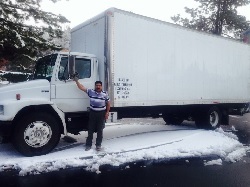 The truck is all white with the company names: JAlex and Pacific Alliance Transport. A Bank of America Business MasterCard was in the truck when stolen. This card has been used multiple times since March 11. The suspect has been using the MasterCard around the North Highlands/Antelope area. The suspect was also observed driving a light brown Lexus (possibly RX). On February 24, 2019, officers were dispatched to the above address regarding a subject who had been robbed at the Dollar General store on Willow Street. Upon arrival officers found a victim bleeding substantially from his head from several lacerations. Per the victim a subject who frequents the area tried to steal his bike. The victim caught up to the subject and a struggle over the bike ensued. During the struggle the suspect brandished a chrome handgun with a black handle and pistol whipped the victim in the head five times. The victim retained his bicycle. An initial missing person investigation was started by officers; however, it was believed Risetruth Vang may have been the victim of foul-play. Homicide Detectives and Crime Scene Investigators responded to the scene and took over the investigation. Through further follow-up and evidence on scene, detectives are now treating this as a potential homicide investigation. The missing person, 73-year-old Risetruth Vang, is 5 foot 3 inches tall and weighs 140 lbs. 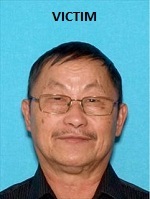 Victim Vang is considered at-risk due to his age and medical conditions. He was last seen Monday, February 18, 2019 by neighbors in the 2900 block of North Meadows Place in South Sacramento. Victim Vang’s primary language is Hmong and detectives believe he may be critically injured or deceased. While the investigation is still very active, detectives believe this is an isolated incident. This press release is a summary of the facts known at this time. This incident is being actively investigated and the information contained in this press release is subject to change. Additional details will be released as they become available.